A few years back, I was asked to write a brief summary about a couple of local businesses for McKinney Magazine. Well, I was fairly new to the writing for a magazine game, so they turned out to be more like “Gone With the Wind” stories about the fascinating folks who made it all work. What I loved, actually adored about writing these stories, was all the friends I made along the way. There are so many, but I’d like to share just one today. In the fall of 2010, I drove over to Blue Mountain Equipment over by the McKinney Airport to take a few pictures of the brand new facility and get a few quotes for my assignment. To my surprise, the president of the company, who lives in Missouri, happened to be there that day. I was escorted to a beautiful boardroom with a long wooden table and several distinguished gentlemen seated on both sides, all waiting to meet with… ME? My heart was pounding so hard, I thought a 747 was landing across the street. It only took a few minutes for my trembling hands to relax and jot down a few names and quotes. I was immediately in awe of the group of men, who were more like family and friends. They took turns recounting how the business started or how they became part of the ‘family’. At the end of the meeting, the president, Stan Crader, told me that he had recently written a book and presented me with a signed copy of “The Bridge”. Then Mr. Crader and his son Justin gave me a personal tour of the huge state-of-the-art building. I took more photos and notes, and thought I’d died and gone to journalism heaven. Again, to make a long story even longer, as I tend to do, Stan and I kept in touch via Facebook and email. I told him that I was reading one chapter a week to my senior art group and they loved his book. A few months later, he surprised us with a visit and more signed copies of “The Bridge”. He stops in and visits us when he is in town and has some extra time. Since that first meeting, he has written an additional two books. You may be wondering why this is all so interesting. Well, Stan Crader may be a very successful businessman, but his passion for writing has allowed him to share his talent and generosity to help the less fortunate. 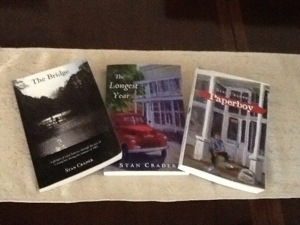 Stan has donated all the profits from his books to various local charities. He is even offering a free download of his first book, “The Bridge,” at his website http://www.stancrader.com But, perhaps you’d like to buy a copy, and support some needy veterans with your purchase. Mr. Crader’s books are amazing glimpses into the lives of hard working families and a group of youngsters growing up in rural Missouri back in the 60’s and 70’s. It’s like reading “Tom Sawyer” with a modern twist. These books would be great to read with your kids or your grandma. You’ll laugh and you’ll cry, and you’ll be supporting a worthy charity. Let me know if you read any of the series, because you’ll find out why I love these books and why I adore Stan Crader. He has taught me what it means to be a great humanitarian and hopefully a better writer. 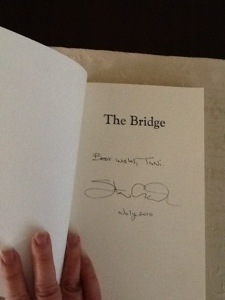 My prized autographed copy of THE BRIDGE.